Mighty Joe Young just earned a $10K bonus – for Coach Dana Altman. Now Duck fans can pay Joe instead. Former RG reporter Joe Moseley has the game news at goducks.com. You can help pay Joe Young instead, at Fan Angel, here. The NCAA is a classic hiring cartel. College athletic departments band together and agree to keep their athletes cash earnings to $0. This leaves lots of profits to pay the coaches and athletic directors. Since colleges and their sports boosters can’t compete for top athletic talent by offering higher pay without risking the Cartel’s wrath, they compete with amenities – such as UO’s Jock Box and Football operations center, with its fine soft corinthian leather barbershop. This junk costs the boosters millions, but it’s worth a few hundred at best to the players. Extremely wasteful competition. Better to pay the players cash. And now a crowd-funding site has figured out how to skirt the NCAA’s rules, by having boosters donate to accounts they hold in escrow for the players, conditional on playing for a given college. ESPN has the news here. Assuming the NCAA’s lawyers can’t shut this down, the $120M Phil Knight has given UO for overblown locker rooms is now looking like a pretty bad investment. 7 Responses to Mighty Joe Young just earned a $10K bonus – for Coach Dana Altman. Now Duck fans can pay Joe instead. I don’t think the student athletes should get paid. They get scholarships, & gear. It just perpetuates the constant hype & escalation of sports. Why should a student athlete get paid & any other student not get paid? There is no logic to it. Free tuition is a huge amount of money- ask any student who is paying their own tuition, & will graduate with a huge amount of debt. 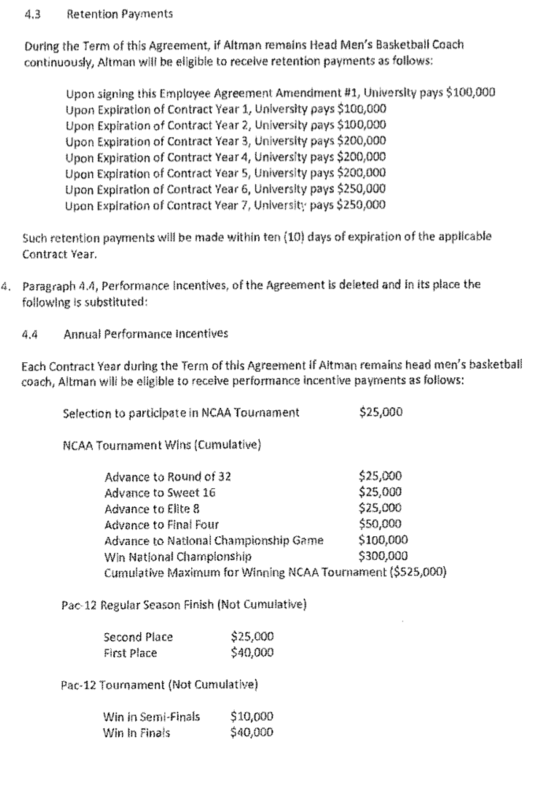 Just curious– will Dana Altman be using his $10K bonus for his own legal fees, or do the students pick up the tab? They have to return the gear or buy it with their own money. If you sell your sweaty shoes, you get benched while your coach gets a car stipend. If a student works/volunteers at a university event they can keep the “tshirt”. If a student works in a dining hall, library, research lab, they get paid. So the issue is not really pay vs. no pay – but how much. It’s absurd that coaches are the best-paid public employees for decades and their careers but athletes who risk their health as full-time as athletes get almost nothing from the value they create. If the created value would benefit the university’s mission – the “greater good” – then I would be more sympathetic to the scholarship model. But right now these students get a pretty sh***y deal from this growing entertainment industry that is completely out of control and only benefits a small number of people. Speaking of returning your gear, is the AD still selling used Ducks football gear as “collector’s items,” as I saw advertised on the bus recently? The margins are tight… or they stopped/changed the business model. We still be grad students stipends and cover tuition? And as was pointed out, paying athletes direclty is probably cheaper than building training complexes which costs $100,000,000’s of dollars. But, then there is no building with their name on it. What are they going to show off to their also-super-rich friends then? How do they prove they’re powerful without as many buildings with their name on them? There are only so many birthdays left to have scantily clad teenagers dance for their amusement.